Originally a narrower thoroughfare, much of Fifth Avenue south of Central Park was widened in 1908, sacrificing its wide sidewalks to accommodate the increasing traffic. The midtown blocks, now famously commercial, were largely a residential district until the start of the 20th century. 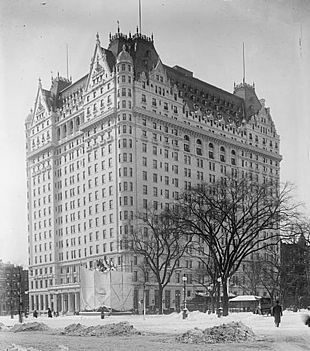 The first commercial building on Fifth Avenue was erected by Benjamin Altman who bought the corner lot on the northeast corner of 34th Street in 1896, and demolished the "Marble Palace" of his arch-rival, A. T. Stewart. In 1906 his department store, B. Altman and Company, occupied the whole of its block front. The result was the creation of a high-end shopping district that attracted fashionable women and the upscale stores that wished to serve them. Lord & Taylor's flagship store was once located on Fifth Avenue near the Empire State Building and the New York Public Library, but has since closed. In the 1920s, traffic towers controlled important intersections from 14th to 59th Streets. Fifth Avenue originates at Washington Square Park in Greenwich Village and runs northwards through the heart of Midtown, along the eastern side of Central Park, where it forms the boundary of the Upper East Side and through Harlem, where it terminates at the Harlem River at 142nd Street. Traffic crosses the river on the Madison Avenue Bridge. 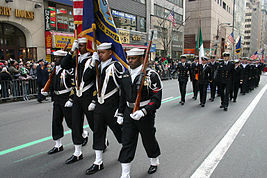 Fifth Avenue serves as the dividing line for house numbering and west-east streets in Manhattan, just as Jerome Avenue does in the Bronx. It separates, for example, East 59th Street from West 59th Street. From this zero point for street addresses, numbers increase in both directions as one moves away from Fifth Avenue, The building lot numbering system worked similarly on the East Side as well, before Madison & Lexington Aves. were retrofitted into the street grid, confusing the building numbers. Confusingly, an address on a cross street cannot be predicted at the intersection of Madison Ave. or Lexington Ave., as these were added decades after the building numbers. It's as if the two retrofitted avenues are not counted for purposes of cross street addresses. The "most expensive street in the world" moniker changes depending on currency fluctuations and local economic conditions from year to year. For several years starting in the mid-1990s, the shopping district between 49th and 57th Streets was ranked as having the world's most expensive retail spaces on a cost per square foot basis. In 2008, Forbes magazine ranked Fifth Avenue as being the most expensive street in the world. Some of the most coveted real estate on Fifth Avenue are the penthouses perched atop the buildings. The American Planning Association (APA) compiled a list of "2012 Great Places in America" and declared Fifth Avenue to be one of the greatest streets to visit in America. This historic street has many world-renowned museums, businesses and stores, parks, luxury apartments, and historical landmarks that are reminiscent of its history and vision for the future. By 2018 portions of Fifth Avenue had large numbers of vacant store fronts for long periods, part of a citywide trend of vacant store fronts attributed to high rental costs. Fifth Avenue is one of the few major streets in Manhattan along which streetcars did not operate. 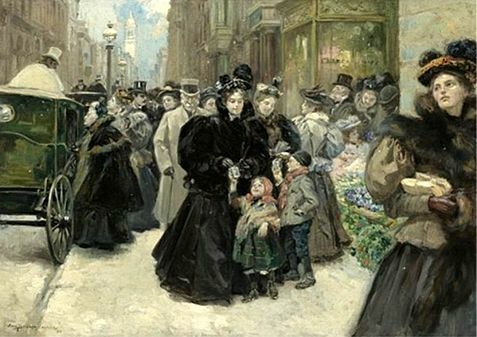 Instead, Fifth Avenue Coach offered a service more to the taste of fashionable gentlefolk, at twice the fare. Double-decker buses were operated by the Fifth Avenue Coach Company until 1953, and again by MTA Regional Bus Operations from 1976 to 1978. Today, local bus service along Fifth Avenue is provided by the MTA's M1, M2, M3, and M4 buses. The M5 and Q32 also run on Fifth Avenue in Midtown, while the M55 runs on Fifth Avenue south of 44th Street. Numerous express buses from Brooklyn, the Bronx, and Staten Island also run along Fifth Avenue. In the late 19th century, the very rich of New York began building mansions along the stretch of Fifth Avenue between 59th Street and 96th Street, looking onto Central Park. 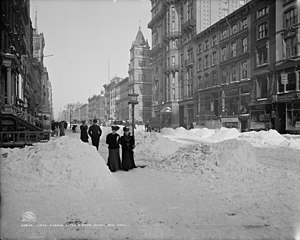 By the early 20th century, this portion of Fifth Avenue had been nicknamed "Millionaire's Row", with mansions such as the Mrs. William B. Astor House and William A. Clark House. Entries to Central Park along this stretch include Inventor's Gate at 72nd Street, which gave access to the park's carriage drives, and Engineers' Gate at 90th Street, used by equestrians. Further south, on the corner of Fifth Avenue and 70th Street, lies the Henry Clay Frick House, which houses the Frick Collection. Between 49th Street and 60th Street, Fifth Avenue is lined with prestigious boutiques and flagship stores and is consistently ranked among the most expensive shopping streets in the world. 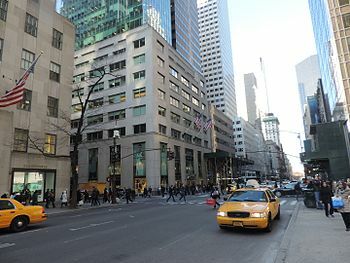 Many luxury goods, fashion, and sport brand boutiques are located on Fifth Avenue, including Louis Vuitton, Tiffany & Co., Gucci, Prada, Armani, Tommy Hilfiger, Cartier, Omega, Chanel, Harry Winston, Salvatore Ferragamo, Nike, Escada, Swarovski, Bvlgari, Emilio Pucci, Ermenegildo Zegna, Abercrombie & Fitch, De Beers, Emanuel Ungaro, Gap, Lindt Chocolate Shop, Henri Bendel, NBA Store, Oxxford Clothes, Microsoft Store, Sephora, Zara, and H&M. Luxury department stores include Saks Fifth Avenue and Bergdorf Goodman. Fifth Avenue also is home to New York's fifth most photographed building, the Apple Store. ^ Google (September 12, 2015). "Fifth Avenue (south of 120th Street)" (Map). Google Maps. Google. Retrieved September 12, 2015. ^ Google (September 12, 2015). "Fifth Avenue (north of 124th Street)" (Map). Google Maps. Google. Retrieved September 12, 2015. ^ "Fifth Avenue The World's Most Expensive Shopping Street (PHOTOS) (Subtext: "For the 9th year in a row, Fifth Avenue between 39th and 60th Streets ranks first among Cushman & Wakefield's Main Streets Across the World Report, according to the New York Post.")". HuffingtonPost.com, Inc. September 21, 2010. Retrieved October 23, 2010. ^ "- Manhattan NYC New York Penthouses for Sale and Rent. Manhattan Penthouse Apartments". www.nycpenthouses.com. ^ Kilgannon, Corey. "The Empty Storefronts of New York: A Panoramic View". Retrieved October 17, 2018. ^ Marting, Diane (2010), New/Nueva York in Giannina Braschi's 'Poetic Egg': Fragile Identity, Postmodernism, and Globalization, Indiana: The Global South, pp. 167–182 . ^ New York City Cycling Map Archived February 19, 2016, at the Wayback Machine, New York City Department of City Planning. Retrieved April 27, 2009. "Brooklyn Bus Map" (PDF). Metropolitan Transportation Authority. November 2017. Retrieved April 24, 2018. ^ Kusisto, Laura (October 21, 2011). "Reaching High on Upper 5th Avenue". The Wall Street Journal. Archived from the original on October 23, 2011. Retrieved February 22, 2013. ^ Sewell Chan (February 9, 2007). "Museum for African Art Finds its Place". The New York Times. Retrieved July 15, 2008. ^ "New Drive Promoting 5th Ave.'s 'Museum Mile'". The New York Times. June 27, 1979. Retrieved July 15, 2008. ^ "The Frick Collection and Frick Art Reference Library Building". National Historic Landmark summary listing. National Park Service. Archived from the original on July 29, 2013. Retrieved November 8, 2013. ^ "National Historic Landmarks Program" (PDF). Archived from the original (PDF) on January 24, 2011. Retrieved February 19, 2011. ^ Roberts, Sam (December 12, 2013). "Koch's Last Residence Is Named a Cultural Landmark". The New York Times. Retrieved May 14, 2015.